Latest report on measuring poverty authored by a committee headed by former Reserve Bank of India (RBI) governor C Rangarajan, has found that as many as 11 major Indian states out of 20 have fewer percent of poor than Gujarat. Submitted to the Modi government as a plea to come up with a new poverty criterion that takes into account “public expenditure that is being incurred in areas like education, health and food security”, and linking it with consumer price index, the report says that Gujarat has 27.4 per cent below poverty line people (BPL), or 1.69 crore – 1.1 crore in rural areas (31.4 per cent) and 5.89 crore (22.2 pe cent) in urban areas. Basing on two separate surveys, carried out by the National Sample Survey Organisation (NSSO), the Government of India’s data collection centre, and the top independent body, Centre for Monitoring Economic Economy (CMIE), the survey, commissioned to the committee about a year ago, has found that at the all-India level there are 36.30 crore BPL -- or 29.5 per cent of the total population: 30.9 per cent in rural areas and 26.4 per cent in urban areas. The survey results are based on data collected by the NSSO and CMIE in 2011-12. The states which have less per cent of poor than Gujarat are Himachal Pradesh 10.9 per cent, Punjab 11.3 per cent, Kerala 11.3 per cent, Haryana 12.5 per cent, Andhra Pradesh 13.7 per cent, Jammu & Kashmir 15.1 per cent, Uttarakhand 17.8 per cent, Maharashtra 20 per cent, Rajasthan 21.7 per cent, Karnataka 21.9 per cent and Tamil Nadu 22.4 per cent. The report compares percentage of BPL in 2011-12 with that of two years earlier – 2009-10. It has found that the number of states with less per cent of poor than Gujarat has remained unchanged – then too 11 major states had less percentage of poor. The comparison suggests that Gujarat has slipped in poverty in the rural areas. Thus, while the percentage of poor in rural Gujarat came down from 37 per cent to 31.4 per cent between 2009-10 and 2011-12, the all-India rural BPL has dropped much faster – from 39.6 per cent to 30.9 per cent. 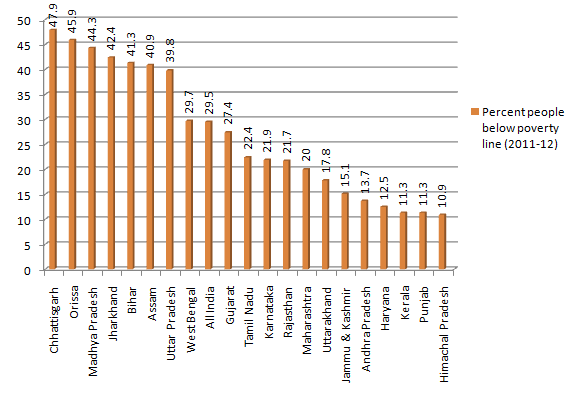 There were 10 states with less percentage of rural BPL than Gujarat in 2009-10, which increased to 12 in 2011-12. 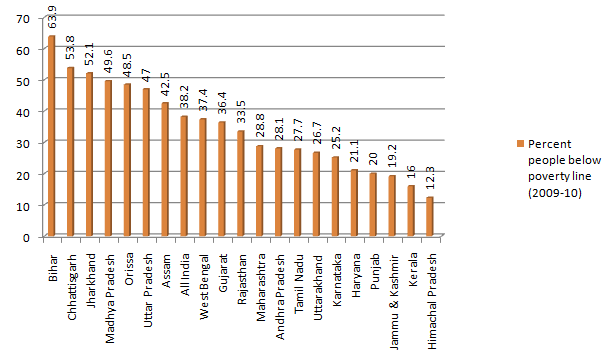 As for the urban poverty, Gujarat (with a BPL of 22.2 per cent) improved its position somewhat – there were eight states having less percentage of poor than the state in 2011-12 as against nine in 2009-10. In Gujarat, according to the report, anyone with a lesser spending capacity of Rs 1,103 in rural areas and Rs 1,507 in urban areas is below poverty line. Observers say, the Rangarajan committee report goes to prove the long-standing view taken by experts who say that growth rate alone cannot lead to reduction in poverty. Official data seek to suggest that Gujarat has grown much faster than most Indian states in agricultural growth. However, the rural poverty in Gujarat has failed to come down as fast as other states.